There has been a lot written and said recently about a number of high profile public service branding projects, most notably with Irish Water and Trinity College, where the online commentary in particular has been very heightened, passionate, and a bit irrational at times. Changing a brands identity often elicits an emotive response (hopefully positive, sometimes not so), but it would seem that in Ireland and in particular since “austerity” has been forced on us, any public service branding and in particular spend on a new logo, has become a vehicle of grievance for some to vent their anger at government and what is seen as “waste” in the public sector in general. How else can the angry reaction to the €20k (reportedly) spent on the Irish Water identity in comparison to the supposed €100M spent on other consultancy services in setting up Irish Water be explained. Perhaps it’s because the logo is so visible and easy to knock that it garnishes more attention. So I guess it begs the question whether public service branding is an effective use of our money? To answer this we first have to address what is meant by branding in the public sector. For some it’s all about the logo, simply a badging exercise, with little obvious benefit (“couldn’t the money be used on something more important”) and if we do have to create a new logo, can’t we buy one online for a fraction of the price or run a school competition and ask students to design one. But this is to miss-understand the purpose of public sector branding. They do this in part because their logos are seen not as a cynical badging exercise stuck on various collateral aimed at fooling the public or papering over the cracks of inefficiencies (and therefore a waste of taxpayer’s money), but rather their brands have real meaning for people. Their logo symbolises real purpose for people, in the case of the BBC to “inform, educate and entertain”. Public sector brands should have the goal of helping to bring about positive change, reforming and improving the lives of people. Some of the best service (as opposed to product) brands in the private sector understand this, using belief and purpose based thinking to bring about behavioural change, both internally with employees in motivating them and how they treat customers and with their customers in terms of the promise they make to them (what the brand stands for) as well as helping to enrich the overall experience (effective communication). 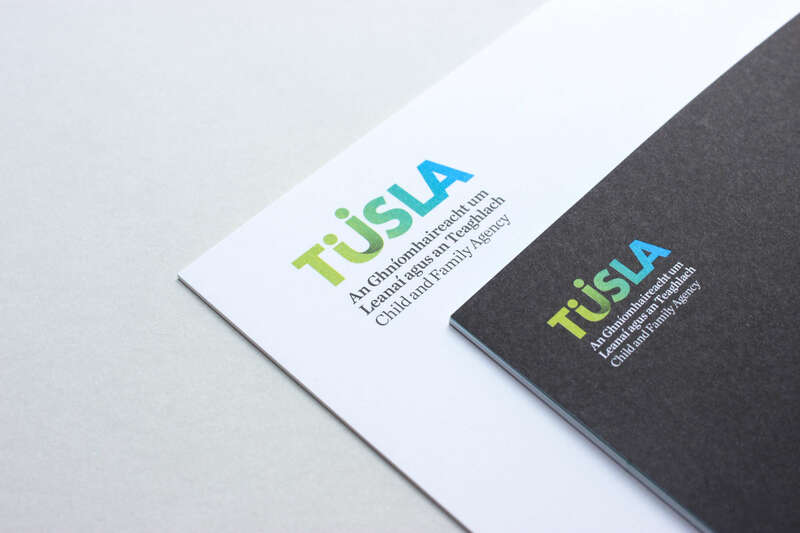 Recently, we have worked on the identity creation of two public service organisations, the new child & family agency, Tusla and the new Intreo one-stop-shops that are currently rolling out around the country. Both organisations have been tasked with bringing about reform and changing the lives for the better of large numbers of Irish citizens. Tusla is about putting “children first, always”, protecting, supporting and aiding them in their development and Intreo, which was set-up as the National Employments and Entitlements Service and has the immediate focus of job activation or helping people to get back to work. Both these services are hugely important to Ireland Inc, but can only really be successful with a focussed and motivated staff, who understand and believe in the brand promise and through clear and effective communication with the general public gain their support. In the private sector, companies understand that brands are essentially designed to be a short cut to understanding, in which consumers of their service will put trust. If they don’t live up to the brand promise or it’s not credible they get found out. In the same way, public sector brands matter to us (or should do) and therefore our dis-course should not be about a new logo but rather how can branding (and great design) bring about real change through restructuring our public service organisations, amalgamating them where savings and efficiencies can be created, merging services and avoiding duplication and waste where we see it, energising and motivating our public service employees through giving them a sense of purpose and meaning (what they do matters) and above all using branding as a vehicle to help bring about reform. The BBC when faced with a freezing of its only source of income (the TV licence fee) in 2010, used its brand to help streamline its communications, services and organisational structure, helping to bring about real saving and efficiencies, without the diminution of quality services to the public. At home, we recently worked on the amalgamation of FETAC, HETAC, IUQB and NQAI to form one organisation called QQI, which not only is a better use of taxpayers money (one set of marketing materials as opposed to 4) but it has also helped streamline the organisation, how it works and communicates with stakeholders. So while the logo is the full stop or the icing on the cake, it is not the brand and therefore the public’s focus should not be on how much the logo cost but rather did the brand help bring about improved workings and communication within our public sector organisations. As an aside, design and in particular good design has the potential to enrich our physical environments, to make our streets and buildings aesthetically pleasing places to be. The Dutch and Scandinavian countries in particular get this and its time that as a country that we started to express ourselves in a manner that is in keeping with our supposed creativity.